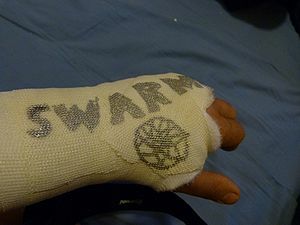 New SWARMies should read the New User Guide and Manifesto. Have something to add? add it! Swarm Processing Unit (SPU) - the "Brain," CPU. Bucket Handle -- extends over the top of the Orb as a platform for antennas and sensors. Our slogan: Kiss my shiny metal orbs! Cal Academy February 23 2012 Success! Private Event February 22 2012 Success! This page was last modified on 2 May 2013, at 23:39. This page has been accessed 668,951 times.